Each canvas bag is 13X13X3 in size, accented with a cheerleader "skirt", trimmed with ribbons, and monogrammed for personalization. We recommend 3 letters (for your middle/high school name or name initials) or a single letter. 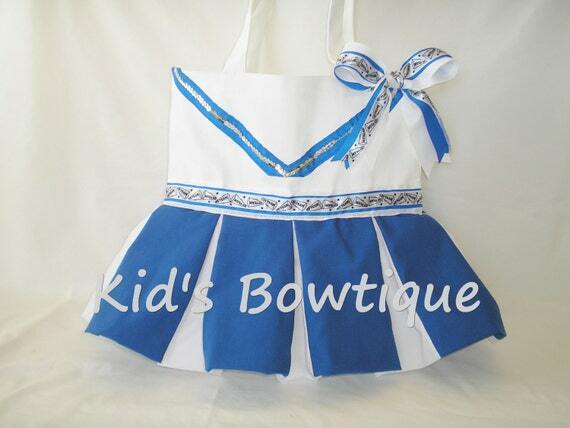 A matching bow is sewn to the bag but you can request no bow. *Bag: You have a choice of black canvas or white canvas bag. *Ribbons: We will match with your skirt/bag colors. If you would like a specific team logo ribbon, please add 1 week to production/ship time to allow us to special order your ribbon.